Oh … Sir: The Insult Simulator is essentially a fighting game where you trade barbs and verbal jabs rather than physical blows to damage your opponent. Whoever comes up with the best, meanest, nastiest, and most clever insults – constructed from a list of words both competitors share – wins. It is a cool concept that is fun for a while, particularly in multiplayer, but it is also limited a bit by its core design. For just $3, though, Oh … Sir is worth a look even if it loses its luster fairly quickly. See our full review for all of the details. Oh … Sir! 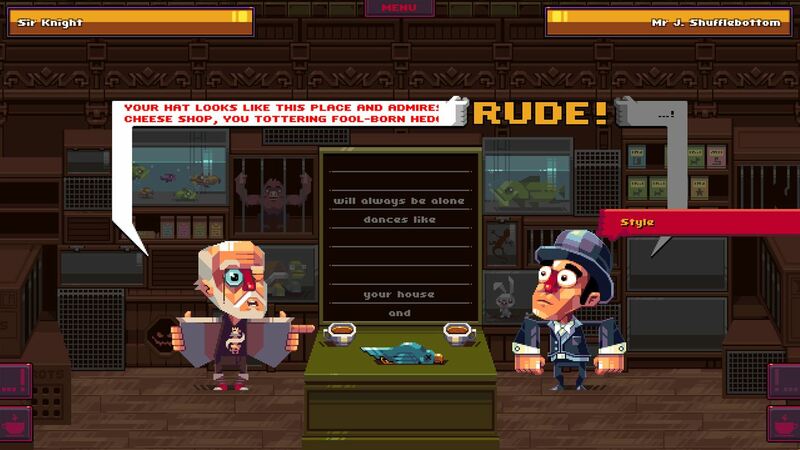 : The Insult Simulator is a sort of Mad Libs game where you choose a character – all British stereotypes – and then insult an opponent by constructing sentences using a list of words. Both players take turns using the same list of words – once a word or phrase is used it’s gone – and there is quite a bit of strategy involved in not just making your own insults, but also recognizing what your opponent is trying to do and using a key word before they can. Strategy also comes into play as each character has different things they are offended by, so learning what your opponent doesn’t like, and then taking advantage of it in your insults, greatly boosts your attacks. You can’t just string random words together, either, as insults have to be grammatically correct and mostly make sense. Long strings of nonsense usually don’t earn as many points as well crafted shorter phrases, for example. Once you have a grasp on how things work, Oh Sir is pretty easy to play. It is pretty limited, however, as there seems to be a fairly small list of words the game gives you to use so you’ll see the same stuff start repeating pretty early on. It is up to the players to turn them into unique and clever insults, of course, but the well runs dry pretty quickly. The distinctly British style of humor also means there are lots of quips and phrases that aren’t particularly funny. Maybe that’s the point, though. Oh Sir offers single player where you can insult the CPU – and this is also how you unlock new characters / locations – but it really shines in multiplayer. Either online or locally, insulting your friends can be a lot of fun for an hour or two. And even when you’ve seen it all and the insults aren’t funny anymore, you can take solace in the fact the game only costs $3. Presentation-wise, Oh Sir gets the job done. The characters have a very distinct visual style and while there isn’t a ton of animation, the little visual changes in the characters as they’re dishing out insults are pretty good. The menus are easy to read and everything is decent enough looking. The sound is also solid and the characters reading out the insults you’ve crafted adds a lot more to the experience than you’d expect. All in all, Oh … Sir: The Insult Simulator is a solid way to spend an evening with some friends and the $3 asking price makes it pretty easy to recommend. 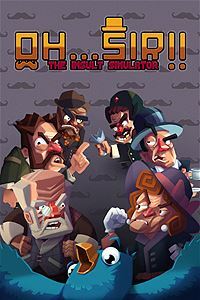 I wouldn’t say it is even remotely in the same class as some other humorous local multiplayer games like The Jackbox titles (especially Fibbage), but at this price it is worth checking out.